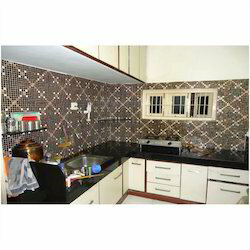 We are best producer of Kitchen Glass mosaic tiles, The design and verity of Glass Mosaic in different available colour make customer happy in her kitchen. Easy to maintain and long life glass mosaic tiles are available in Random Mix and first choice of kitchen interior decorators. PRISTINE (SIA MOZ ART) MOSAICS founded in 2014, is now industry leader in the production of glass mosaic tiles. With a rich industry experience in manufacturing high quality glass mosaic tiles, we are offering distinct range of glass mosaic tiles. PRISTINE (SIA MOZ ART) MOSAICS allows the designers an unbelievable, first of its kind palette of colours and textures creating stunning visual effects covering most architectural needs. 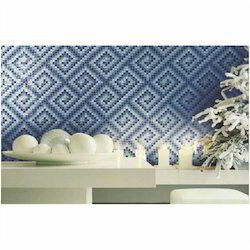 These mosaic tiles are provided with fine polishes to give them brushing effect. 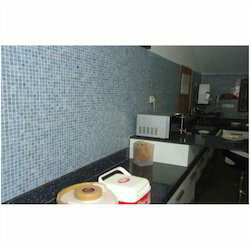 In addition to the manufacturing, we also provide fixing of glass mosaic tiles. As a series of glass mosaic tiles range, catters to the Government sector as urban designs and remodeling projects use our glass mosaic tiles. We also catters to private residential sector as interior and exterior projects use our glass mosaic tiles extensively for swimming pool, bathroom, dinning hall, entrance wall, lobby, staircase, pillars, lakes, water parks, under water glass mosaic, ceramic mural designs, borders, decorative porcelain tiles, glass mosaic adhesive, Glass mosaic grout. The main thing to think about is the material Glass Mosaic Tiles, you would like to use and the total cost for the size you need. There are many options with us and it is not an easy decision to make. Don't forget to ask yourself a question too about How easy it is to clean too. 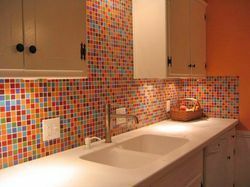 Glass Mosaic Tiles Splashback simple, inexpensive and easy to cleen. It will suit almost any Kitchen Design and comes in many color options, but make sure you consider the color of other furniture arround. 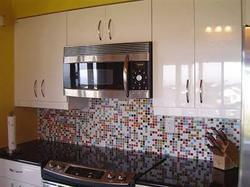 Being a client-centric organization, we are engaged in offering Kitchen Glass Mosaic Tiles. This product is ideal for extensive interior as well as exterior cladding decoration. This product is designed under the vigilance of the skilled professionals, using premium quality basic material in tandem with set international standards.